Des Goss, Phillip Audsley, Peter Venn, Arthur Stead, Dale Baxter and Steven Odgaard. Cruise report - Oyster Point, Cleveland, Saturday 6th June 2009. The last club cruise was held on Saturday 6th June 2009 from Oyster Point, Cleveland. 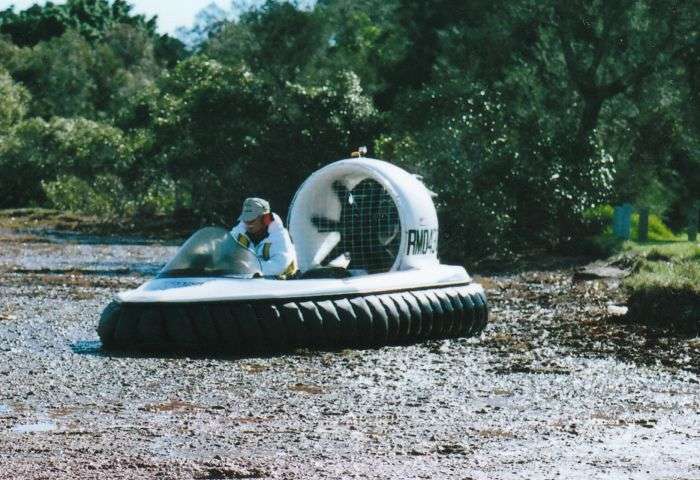 Mick Rutterman - ASV Vortex. Steven Odgaard - Billy Baker 2 (static display). Jim & Stirling Calder - Hornet MX400 (static display). Jim Calder and his son Stirling visited and brought along their Hornet MX400 for static display. 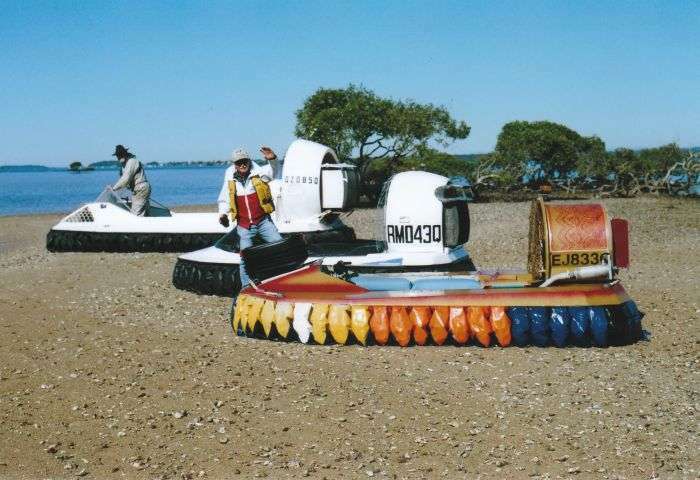 Jim recently purchased this craft from Cobar in western NSW, and is currently getting it back into shipshape condition so he can join us on future cruises. Des Goss came by road with his Turbo Wedge 225 in tow, and Steven Odgaard brought along the Billy Baker 2 for another static display. 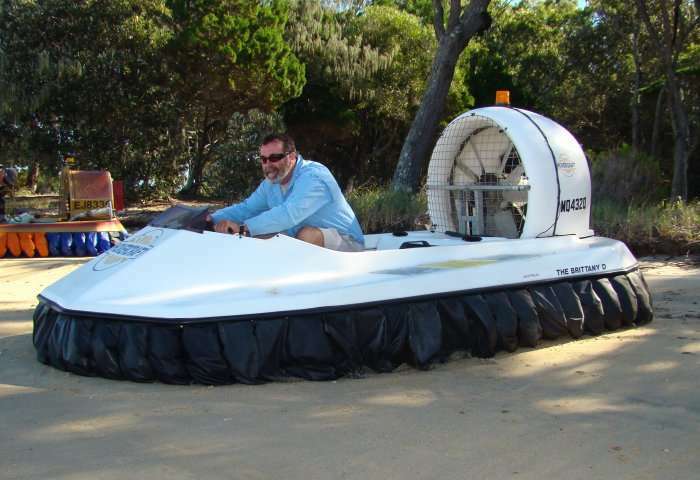 Peter Venn in the Turbo TP6, Arthur Stead in the Revtech Renegade and Mick Rutterman in the ASV Vortex all arrived at the Oyster Point boat ramp by sea. Peter and Arthur travelled 20 kilometres from Lagoon Passage, and Mick travelled 5 kilometres from his home on Coochiemudlo Island. Arthur did his usual trick of forgetting to put the bungs in, but he didn't realise it until landing at Oyster Point. Unfortunately his bungs were still back at Peter's place, so Steven drove him to the marine centre at Capalaba for some spares. 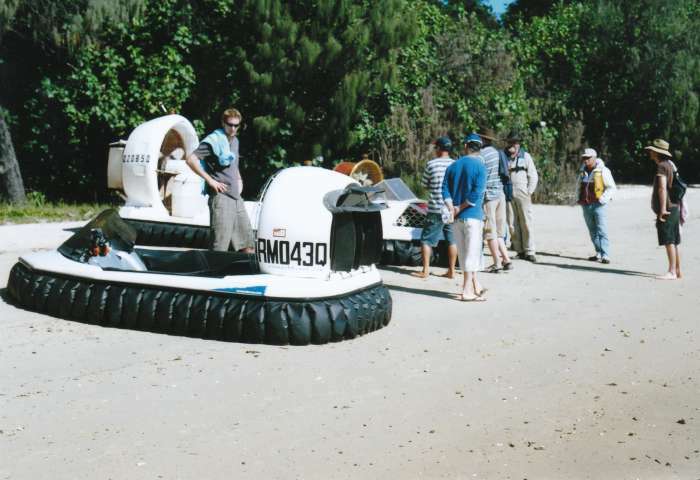 At 10:30 am Mick gave some friends a few joy rides, and shortly after that, Peter, Steven, Arthur and Des set off for Fison Channel and Sandy Island. After crossing the wake of a Cleveland vehicle ferry the lads received a bumpy ride and Arthur's craft lept airborne before crashing into the third wave. 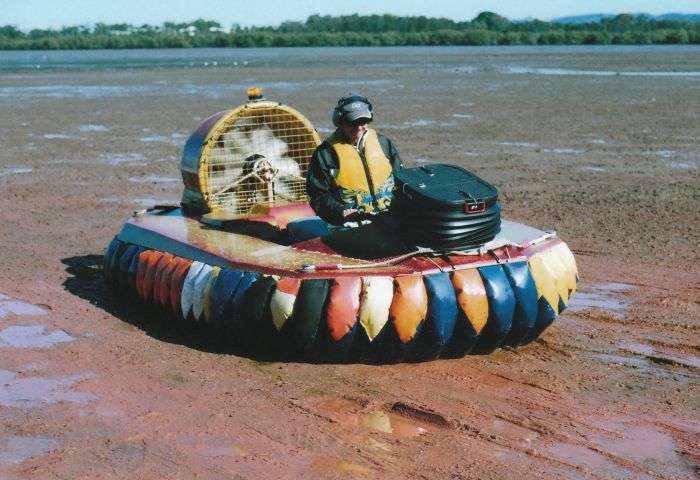 Des lost speed and struggled to regain hump speed, but after stopping on a sandbar realised he had left the protective plastic bags over the air filters. There were three sand banks after Fison Channel, and due to a flock of resting pelicans we steered well north of the second sand bank. After we had bypassed this sand bank, these curious birds took flight and followed us all the way to Sandy Island, then settled down close to where we had pulled up in the hovercraft so they could have another look. 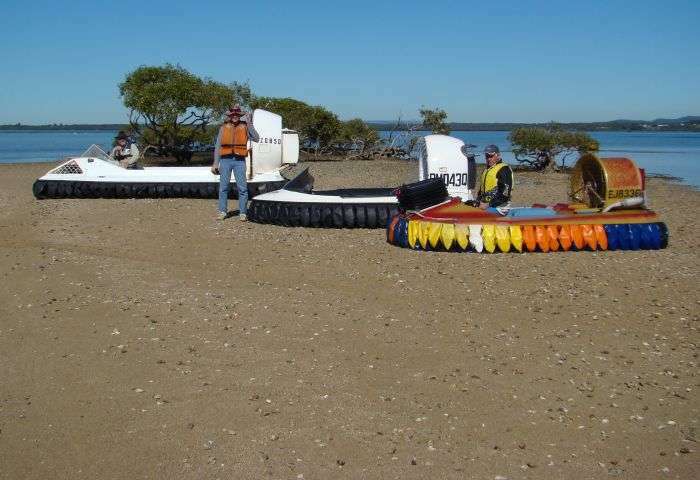 With calm open bay conditions we decided to press on to the east of Coochiemudlo Island but stopped briefly on the northern beach and chatted with a few day trippers who took an interest in the hovercraft. We continued down to the south east corner of the island and saw Mick over near Victoria Point, so Peter took off after him to draw attention to our position. After a short walk through the park we arrived at the Matthews Flinders Cafe and enjoyed a light lunch of tea, coffee and hot chips. The return trip to Oyster Point via Point Halloran was quite smooth with the receding tide even though the wind had picked up a little. 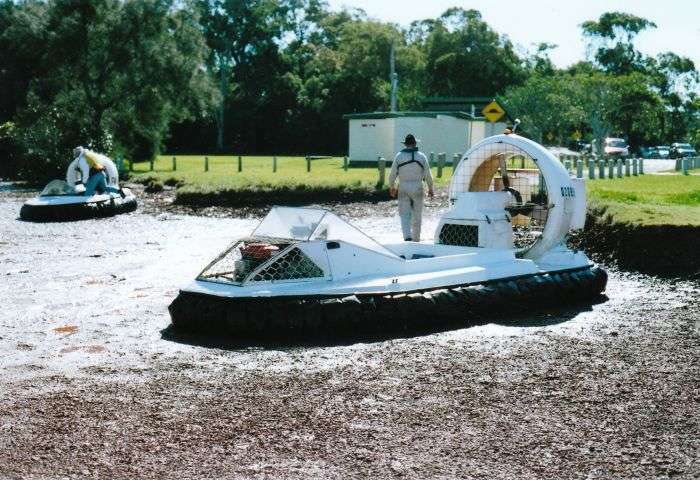 After Des and Steven packed up, Peter and Arthur headed south for the long trip back to Redland Bay and the Muriel Street hover port, travelling all the way over the shallow glassy waters produced by the low tide. Two days later on the Queens birthday holiday, Arthur reported that Peter, Elaine, Judy and he were enjoying a pleasant picnic lunch on South Stradbroke Island at a beach void of boats due to the shallow foreshore. Another perfect winter's day in Queensland. Jack Hickmott of Proserpine has contacted Barry Fennell of Maryborough for a joint run. 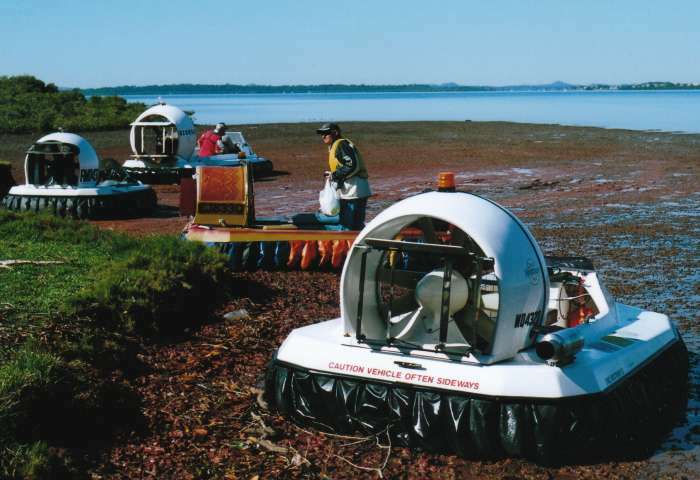 Last week Jack and a colleague took their HoverStar out for a run on Proserpine Dam. They gathered a good speed and had been cruising for about 15 minutes when the Rotax stopped dead. They were towed in by a passing boat. After dismantling the engine they found that the crankshaft had slipped in one of the pressed joints, which had thrown out the ignition timing and heavily stressed the lower casing. 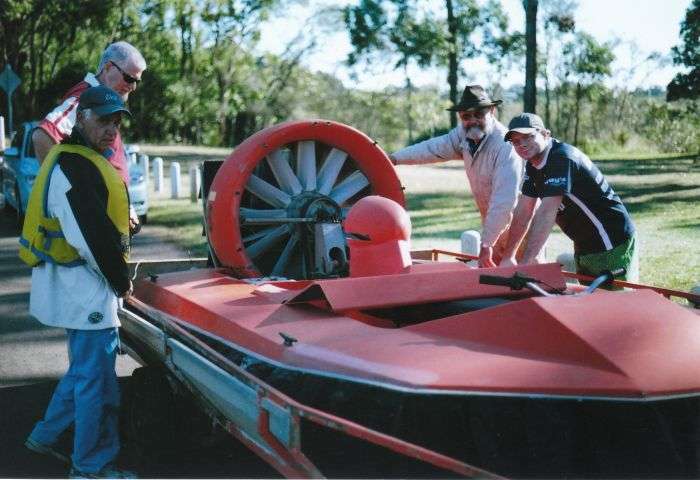 The next club cruise will be on Saturday 4th July 2009 on the Logan River at Eagleby. 7:30 pm - Tuesday, 21st July 2009.